especially from mosquitoes. Mosquitoes in Florida carry four types of virus called arboviruses. These viruses are; St. Louis encephalitis (SLE), Eastern equine encephalomyelitis(EEE), Western equine encephalitis , and West Nile Virus (WN). newly reported in the state, but it is quickly becoming a health concern. also cause rash or muscle weakness. People 50 and older tend to be more severely affected by SLE or WN viruses. WN vaccine is being developed. SLE, EEE, and WN pass back and forth between birds and mosquitoes. health department or local Fish and Wildlife Conservation Commission office). Another indicator that WN or EEE may be present is through horses. time, however, a doctor can treat the systems. There is a vaccine for horses. symptoms results if a person is bitten by an infected mosquito. people and needs high humidity. It mainly flies at dawn and dusk. This is the number one insect-borne disease to human in the world. Florida, however, has fewer than 100 cases. dusk. Prevention of mosquito bites is the key. 1. Dawn to Dusk: Avoid being outdoors during this time. 2. Dress: Wear protective clothing if you must be outdoors. 3. DEET: Use products containing DEET to prevent mosquito bites. areas in the yard where water may collect undisturbed for a week or more. 5. Screen: Make sure house windows are closed and sealed with a screen. 2012 was the largest and most deadly outbreak of West Nile virus (WNV) since 1999 when it first appeared in New York. The best way to prevent West Nile virus disease is to avoid mosquito bites. It only takes a single mosquito bite to make you or your family member sick with West Nile virus – just one bite could make you or your loved one sick, cause severe illness, or even death. Don’t risk your health this summer! More than 37,000 people in the U.S. have been reported with West Nile virus disease since 1999, and of those over 16,000 have been seriously ill and more than 1,500 have died. Many more cases of illness are not reported to CDC. It is estimated that over three million people from every state (except Alaska and Hawaii) have been infected (780,000 became sick) in the 14 years since West Nile virus came to the U.S.
All 48 states in the continental U.S. have had human West Nile virus cases. Though anyone can get infected with West Nile virus, there are people at higher risk for severe disease. People over the age of 50 are at higher risk for encephalitis. The reasons one person becomes severely ill and another doesn’t aren’t entirely known. Where is West Nile virus a problem? Some states, such as those in highlighted in black on the map to the right, had greater concentrations of cases of severe disease than others represented in lighter colors in 2012. This can change each year. Some areas of the U.S. are affected by other viruses such as eastern equine encephalitisvirus, LaCrosse encephalitis virus, and dengue. Why take a chance? Prevention is up to you. No one is safe from West Nile virus, but there are steps you can take to help prevent an infection. Avoid the weeks even months of aches and fatigue that come with West Nile fever, or the more severe problems of being hospitalized with encephalitis or meningitis (inflammation of the brain and surrounding tissues). Apply insect repellent on exposed skin and clothing when you go outdoors. Use an Environmental Protection Agency (EPA)-registered insect repellent. Permethrin sprayed on clothing provides protection through several washes. Don’t spray repellent on skin under clothing and don’t use permethrin on skin. Cover up! Wear long sleeve shirts and long pants and socks while outdoors to prevent mosquito bites. Avoid mosquitoes. The mosquitoes that spread West Nile virus bite between dusk and dawn. Limit the amount of time you spend outdoors during these hours. If you are outside, be sure to wear repellent and protective clothing. Support your local community mosquito control programs. Mosquito control activities are most often handled at the local level, such as through county or city government. 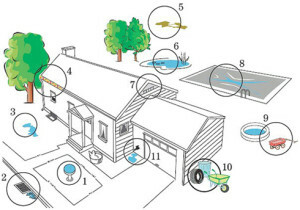 The type of mosquito control methods used by a program depends on the time of year, the type of mosquitoes to be controlled, and the habitats where the mosquitoes live. Methods can include eliminating mosquito larval habitats, applying insecticides to kill mosquito larvae, or spraying insecticides from trucks or aircraft to kill adult mosquitoes. Your local mosquito control program can provide information about the type of products being used in your area. Check with your local health department for more information. What repellent should I use? CDC recommends a variety of effective repellents. The most important step is to pick one and use it. There are those that can protect you for a short while in the backyard or a long while in the woods. DEET, picaridin, IR3535 and the plant-based oil of lemon eucalyptus are all repellents recommended by CDC. All contain an EPA-registered active ingredient and have been evaluated for efficacy and safety. EPA has a long listing of every registered repellent brand in the U.S. There are good repellents for every budget, age and preference. No symptoms in most people. Most people (70-80%) who become infected with West Nile virus do not develop any symptoms. About 1 in 5 people who are infected will develop a fever with other symptoms such as headache, body aches, joint pains, vomiting, diarrhea, or rash. Most people with this type of West Nile virus disease recover completely, but fatigue and weakness can last for weeks or months. Severe symptoms in a few people. Less than 1% of people who are infected will develop a serious neurologic illness such as encephalitis or meningitis (inflammation of the brain or surrounding tissues). The symptoms of neurologic illness can include headache, high fever, neck stiffness, disorientation, coma, tremors, seizures, or paralysis. See your healthcare professional if you think you have the symptoms of West Nile infection.